I have been slightly obsessed of late with the idea of making fresh pasta. I’m sure that those who know I like to cook are surprised to learn that I do not regularly crank out my own fresh noodles. I have to admit to having been slightly scarred by my first attempt, more than 15 years ago, when my roommate Cathy and I decided to make fresh pasta for her boyfriend-now-husband and my boyfriend-of-the-month. Did I jinx our attempt by buying fresh pasta as backup? Or maybe we relied too much on the fact that Cathy (née Licata) is Italian-American. 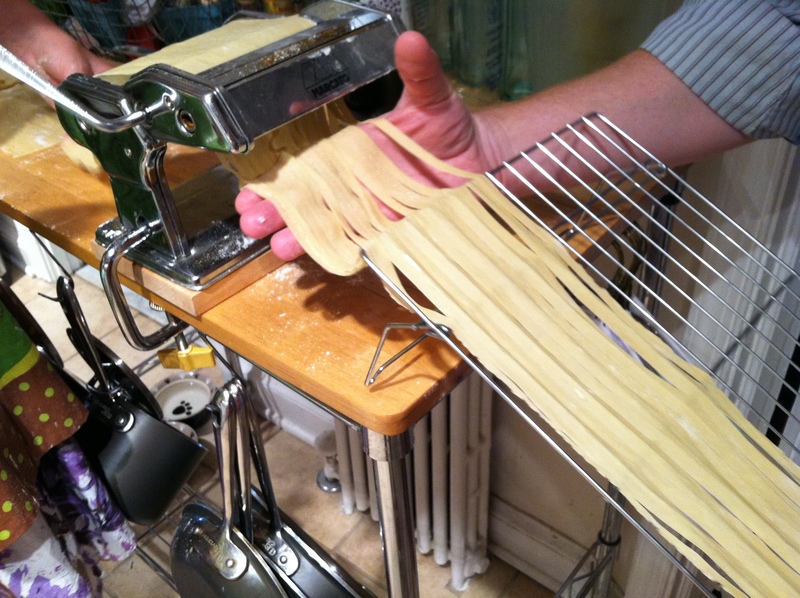 Aren’t Italians born with the ability to effortlessly make pasta? Okay, her pasta maker didn’t come with directions. We could figure it out, right? Fast forward to the present day. For the better part of six months, I have been watching the pasta making class schedule at Hill’s Kitchen, but every time a class was offered, I either had the kids or a can’t-get-out-of work event. It turns out my friend Adrienne bought spaces in the class for her boyfriend for Valentine’s Day (too cute, I know) and after taking the class themselves, they very graciously offered to impart their new found knowledge on me. All I had to do was bring the wine. I don’t think I have ever been so intimated by a bowl of flour, salt and eggs. I have kneaded many a loaf of bread in my day, and I always make my own pizza dough. But I admit to being intimated by these simple ingredients and what I was expected to produce out of them. Luckily, Adrienne was a patient teacher, so I followed her lead with my own well of flour and eggs. After we let our pasta dough rest (during which time we moved on from sparkling wine to chardonnay) on came the part that I most dreaded: turning the dough into long strands of edible glory. By the time I had watched Adrienne’s tutorial with the pasta maker and took my first turn running the dough through it, I was hooked. Then I tasted the fruit of our labor (served simply with olive oil, freshly grated parmesan and fresh basil) and I knew what my next kitchen toy would be. This morning, on a whim, a craigslist search yielded what I thought I might find: a couple looking to off-load their pasta maker, new in the box, a duplicate wedding gift they never got around to exchanging. It now sits in my kitchen, next to my already dogeared copy of “The Glorious Pasta of Italy” by local food writer Domenica Marchetti, whom I had the pleasure to meet in person at a recent book signing of said book. As for dinner tonight, Adrienne was kind enough to send me home with extra pasta. My only struggle is what sauce to make. I’m officially reunited with my kitchen. Clearly the pasta making gene skipped a few generations in the Licata family. Sounds delicious!